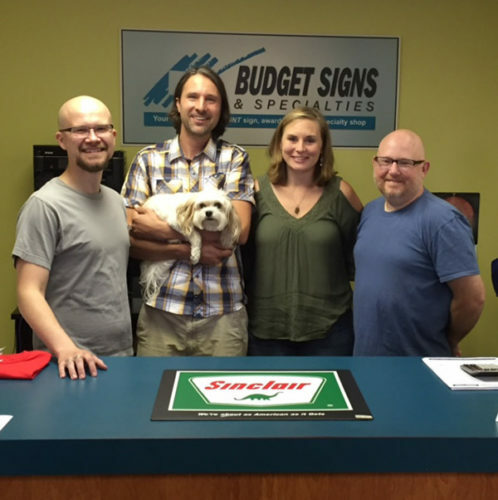 Budget Signs & Specialties has been in business in Madison, Wisconsin since 1988. Over the years we have constantly upgraded our products and services to best serve you. We offer state-of-the-art technology to best provide you with the quality of product you want, at the price you can afford. Signs & Banners – Full color digital printing, vinyl lettering & logos, screen printing, engraving and more. Awards & Engraving – Top quality laser engraved plaques, awards, name badges, industrial markings and more. T-Shirts, Caps & More – We feature screen printing, embroidery and sublimation for custom shirts & more. No order is too large or small. Promotional Items – We offer a search engine of over 800,000 promotional products that can be custom imprinted with your logo or graphics, from mugs to pens to gifts and more. As a union company, we can imprint many items with a union label, and feature a variety of American made products. This site includes many functions that allow you to work with us from our office or home. Of course, it’s sometimes still necessary (or preferred) to conduct business in-person. That being said, we’ve provided the necessary information to locate us or make contact with one of our representatives. We are located right off the beltline at the West Broadway/Southtowne exit. We are immediately behind Walmart on Industrial Drive. Take the roundabout to the left at Industrial Drive; we are about a block up on the right hand side of the street.